Gold-tone stainless steel case with a gold-tone stainless steel bracelet with black ceramic links. Fixed bezel. Black dial with gold-tone hands. Diamonds set at the 3, 6, 9 and 12 o'clock positions. Dial Type: Analog. Quartz movement. Scratch resistant flame fusion crystal. Pull / push crown. Solid case back. Case diameter: 22.7 mm. Case thickness: 10 mm. Rectangle case shape. Band width: 15 mm. Band length: 6.6 inches. Deployment clasp. Water resistant at 50 meters / 165 feet. Functions: hour, minute. Dress watch style. Watch label: Swiss Made. 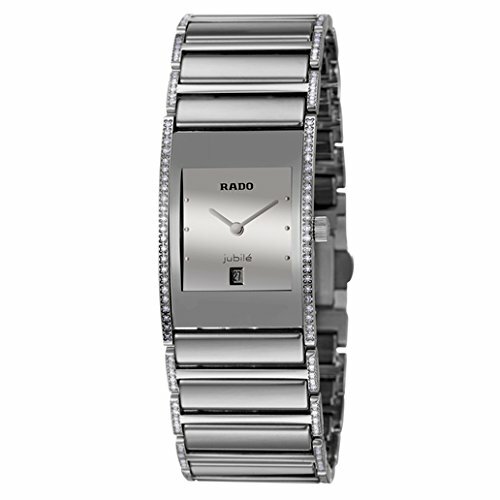 Rado Integral S Quartz Jubile Diamond Ladies Watch R20845712. Gold-tone stainless steel case with a two-tone black ceramic and gold-tone stainless steel bracelet. Fixed bezel. Black dial with gold-tone hands and 4 diamond hour markers. Date display appears at the 3 o'clock position. Quartz movement. Scratch resistant sapphire crystal. Case diameter: 31.1 mm. Case thickness: 6.7 mm. Triple folding clasp. Water resistant at 30 meters/ 100 feet. Functions: hours, minutes, seconds, date. 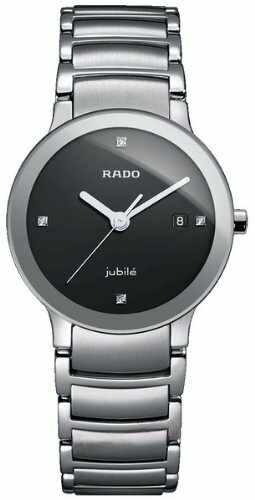 Rado centrix jubile black dial two tone ceramic watch r30930712. White ceramic case with a white ceramic bracelet. Fixed white ceramic bezel. White dial with silver-tone hands and diamond markers at the quarter hour positions. The Rado name appears below the 12 o'clock positions. Quartz movement. Scratch resistant sapphire crystal. Solid case back. Case diameter: 27 mm. Deployment titanium clasp. Water resistant at 30 meters / 100 feet. Functions: hours, minutes, seconds. 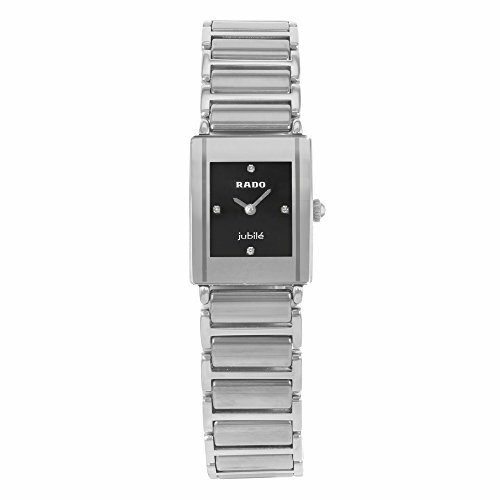 Rado True Jubile Ladies Watch R27696712. Black ceramic case with a black ceramic bracelet. Fixed black ceramic bezel. Black dial with silver-tone hands and diamond hour markers. Dial Type: Analog. Quartz movement. Scratch resistant sapphire crystal. Solid case back. Case diameter: 26.5 mm. Case thickness: 7.5 mm. Round case shape. Deployment clasp. Water resistant at 30 meters / 100 feet. Functions: hour, minute, second. Casual watch style. 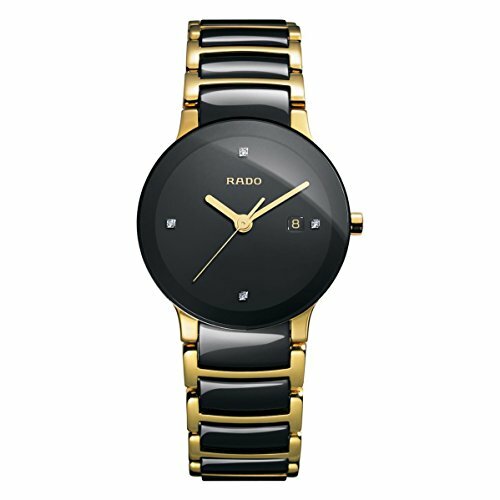 Rado True Jubile Black Ceramic Ladies Watch R27655762. Black ceramic case with a black ceramic bracelet. Fixed black ceramic bezel. Black dial with silver-tone hands. 68 diamonds set around the outer rim. Quartz movement. Scratch resistant sapphire crystal. Solid case back. Case diameter: 27 mm. Deployment titanium clasp. Water resistant at 30 meters / 165 feet. Functions: hours, minute, seconds. 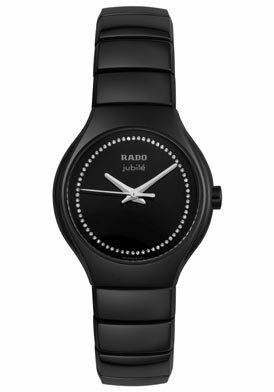 Rado True Jubile Black Ceramic Ladies Watch R27655732. Black ceramic case with a black ceramic bracelet. Fixed black ceramic bezel. Black dial with gold-tone hands and diamond markers at the quarter hour positions. Quartz movement. Scratch resistant sapphire crystal. Solid case back. Case dimensions: 22 mm x 20 mm. Case thickness: 8 mm. deployment clasp with double push button. Water resistant at 30 meters/ 100 feet. Functions: hours, minutes, seconds. 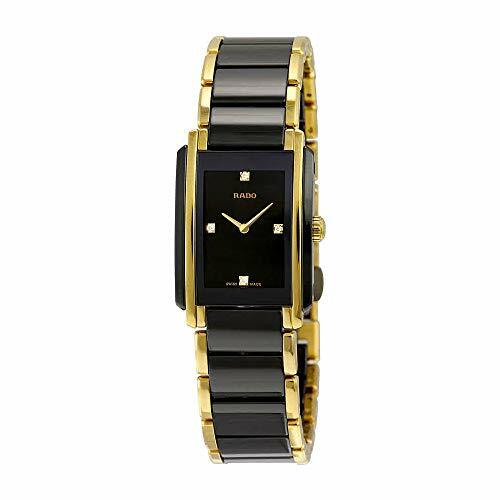 Rado Sinatra Ladies Watch R13726712. THIS PRE-OWNED RADO INTEGRAL R20488722 IS A BEAUTIFUL WOMENS TIMEPIECE THAT IS POWERED BY A QUARTZ MOVEMENT WHICH IS CASED IN A STAINLESS & CERAMIC CASE. IT HAS A RECTANGLE SHAPE FACE, DIAMONDS DIAL AND HAS HAND DIAMONDS STYLE MARKERS. IT IS COMPLETED WITH A CERAMIC BAND THAT OPENS AND CLOSES WITH A TITANIUM FOLDING CLASP.. BUY WITH CONFIDENCE KNOWING EACH TIMEPIECE GOES THROUGH THE SAME RIGOROUS 31-POINT INSPECTION. REST ASSURED ONLY AUTHENTIC PARTS STRAIGHT FROM THE MANUFACTURER ARE USED. THE CERTIFIED PRE-OWNED PROGRAM ON AMAZON ENSURES PEACE OF MIND AND TRANSPARENCY VIA STANDARDIZED REPORTS AND A 1 YEAR WARRANTY PROVIDED BY WATCHFACTS. Shopping Results for "Jubile Womens Watch"